Hollywood has always seemed to find a way to give cinephiles a steady diet of disaster films even dating back to beginning of the 20th century. However, this genre only became highly successful in the 1970s. During this decade, the disaster film genre grew to mainstream prominence thanks to films such as Airport (1970), The Poseidon Adventure (1972), Earthquake (1974), and The Towering Inferno (1974). Then in the 1990s this genre experienced a great resurgence, which contained films that still managed to feature the courageous hero fighting against tragedy and human cowardice. However, these films also began to put more emphasis on the destruction aspect thanks to the rapid improvements in special effects. These films include Independence Day (1996), Volcano (1997), Deep Impact (1998), and Armageddon (1998). Also one can even include the romance heavy, winner of 11 Academy Awards, Titanic (1997) into this genre. Without a doubt, this genre has produced a solid amount of great films that to this day still continue to provide high quality entertainment. Unfortunately, in recent years this genre has been everything but epic. This last decade plus has seen a lot of flops in this genre, which has led to this genre being devalued. Films like 2012 (2009) and Into The Storm (2014) have definitely done a disservice; however, we may be at the beginning of another revival. San Andreas showcases the aftermath of a series of massive earthquakes that has nearly destroyed all of California. Thousands if not millions have died and millions more are forced to try to safely relocate. 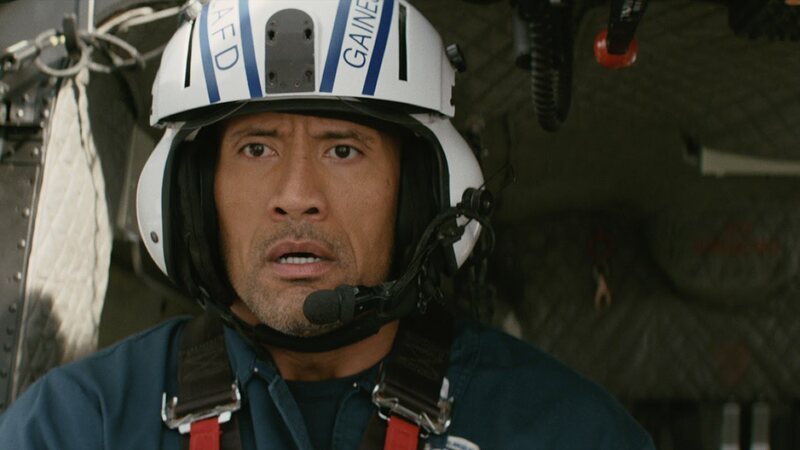 As first responders are dispatched to help the people of California, one Los Angeles Fire Department rescue pilot, Ray Gaines (Dwayne Johnson), has to take care of family matters first. Ray must use all of his skills and resources to save his soon to be divorced wife, Emma (Carla Gugino), and their daughter, Blake (Alexandra Daddario). Can this estranged family pull together and survive this catastrophic event, or will they be further torn apart? I can sit here and nitpick all of the faults that are found in San Andreas. Sure, the film can be extremely predictable in its execution. Some of the action does come off as overdone, and the story is trite in areas. Also the film does run about 15-20 minutes too long. However, that still does not take away from the great fun San Andreas provides. At its core, it is truly an action packed film that contains great special effects, and plenty of awe-inspiring, death-defying stunts. The energy and enthusiasm never dips below neutral, which ultimately causes a rush of exhilaration. Once the disaster hits, and the earthquakes do hit early and often, the pace never subsides. Director, Brad Peyton, was able to creatively capture the pure scale destruction through a multitude of action sequences that deliver plenty of tension and thrills. Peyton and company has created a massive spectacle that simply knows its job and knows what a disaster film should be, and that does go along way in making this film largely entertaining. One of the most endearing qualities if not the best characteristic of San Andreas is that among the chaos and destruction there is large amounts of heart and sincerity. The film is about family just as much as it is about natural disasters. This along with the many likeable characters in San Andreas, we are finally provided with characters that are worth rooting for, which has been absent in a lot of recent disaster films. The success of creating these likeable characters is mostly due in part to the well-casted actors in the movie starting with former wrestler, Dwayne Johnson. I think it is time to acknowledge that Dwayne Johnson is becoming (if not already) the action star of this current generation. Time and time again he has proven more than capable in carrying a picture with his charisma and has also proven his ability to improve with each role. This go around sees Johnson being at the center of nearly every scene and is the main reason why this film works so well. He is obviously great in all the action scenes, and perfectly acknowledges the tongue-in-cheek moments of the film without being too serious or too deprecating. In addition, his performance has a lot of authentic heart and emotion. 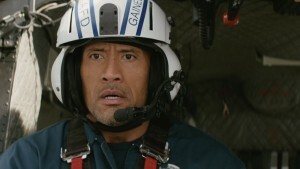 Johnson comes off as the most genuine he as ever been, and he is the key aspect why San Andreas will connect with the audience and why this film can be a box office smash hit this summer. Along with the great Dwayne Johnson, the actresses of San Andreas are thankfully more vital to the story than just being damsels in distress. This time we have strong female characters that carry their own weight equally. Carla Gugino is a great partner for Johnson and is perfect in helping him hone his more subtle side. When the film briefly moves away from Johnson and Gugino, the film focuses on Alexandra Daddario who does her best to navigate to safety. She is accompanied by two Brits, Ben (Hugo Johnstone-Burt) and Ollie (Art Parkinson), who are taking a holiday to the Bay Area. These three are a good change of pace and provide a lot of the comedic relief, while also showing the carnage from a different perspective. In addition, I would be remiss not to mention the great Paul Giamatti. He plays a Cal Tech professor that warns everybody about the moving fault lines and is just the actor that is made to read those typical lines in disaster films. Although San Andreas may have not reinvent the disaster film genre, it most definitely knows how to create great fun at the theater. In a Summer that is going to see multiple comic book movies, reboots, and sequels- San Andreas is a welcome shake up to the movie releases. The cast includes: Dwayne Johnson (Furious 7), Carla Gugino (Watchman), Alexandra Daddario (True Detective), Paul Giamatti (Sideways), Hugo Johnstone-Burt (Miss Fisher’s Murder Mysteries), and Art Parkinson (Dracula Untold). It was written by Carlton Cuse (Lost) and directed by Brad Peyton (Journey 2: The Mysterious Island).